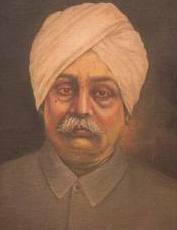 Lala Lajpat Rai (1865–1928) was an Indian author and freedom fighter. He was popularly known as Punjab Kesari (The Lion of Punjab). His death anniversary (November 17) is celebrated as martyr's day in India. He founded the National College, inside the Bradlaugh Hall in Lahore to impart quality education to the Indians, who did not want to join British institutions. Bhagat Singh was a graduate from the National College. He was one of the three most prominent Hindu Nationalist members of the Indian National Congress.The other two members of the trio were Bal Gangadhar Tilak and Bipin Chandra Pal. They were known as Lal-Bal-Pal trio. They formed the extremist faction of the Indian National Congress, as opposed to the moderate one led first by Gopal Krishna Gokhale. Lalaji actively participated in the struggle against partition of Bengal. Along with Surendra Nath Banerjee, Bipin Chandra Pal and Aurorbindo Ghosh, he lead the Swadeshi movement which started in 1905. Lajpat Rai was arrested in 1907 for creating "turmoil" in Rawalpindi. He was put in Mandalay jail for six months. After that he visited UK and USA to guide the freedom struggle movement lead by immigrant Indians,mainly Punjabi Indians. At this time First World War broke out and he was unable to return to India. He went to USA to galvanize support for India. He founded the Indian Home League Society of America and wrote a book called "Young India". The book severely indicted British rule in India and was banned in Britain and India even before it was published. He was able to return to India in 1920 after the end of World War. After returning from USA, Lajpat Rai was elected President of the Congress party in the Calcutta Special Session of 1920. He disagreed with Gandhiji's suspension of Non-Cooperation movement due to the Chauri-Chaura incident, and formed the Congress Independence Party, which had a pro-Hindu slant. In 1928, British Government decided to send Simon Commission to India to discuss constitutional reforms. The Commission had no Indian member. This greatly angered Indians. In Lahore, Lajpat Rai led one such procession against Simon Commission along with Pandit Madan Mohan Malaviya. While the procession was peaceful, British Government brutally lathicharged the procession. Lajpat Rai was badly injured and died on November 17th.